Want to know about how to upgrade the level of class of travel in trains? In this post, you will definitely come to know of the same. As per IRCTC ticket bookings and auto upgradation feature, if a user clicks on ‘No’ option for upgradation while at the time of booking, then his or her PNR will not be considered for upgradation. IRCTC that is Indian Railways Catering and Tourism Corporation is known to manage the tourism, catering and online ticketing operations of the Railways, letting people easily to upgrade to the higher level of class of travel. 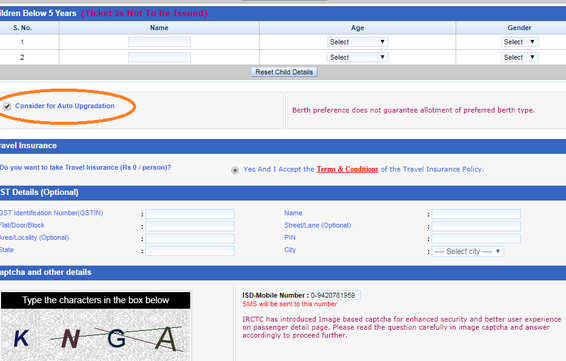 Even the department of Railways provides the option of auto class upgradation at the time of online ticket booking. Under the same feature, IRCTC enhances and upgrades even the full fare paying passengers who are under waiting list status to the next available higher class vacant accommodation too. Though, if any passenger has clicked or selected on the ‘No’ option at the time of booking in his or her booking form for upgradation, then his or her respective PNR – Passenger Name Record will not be considered at all for free passes holders or concession tickets and it also involves senior citizens travel, as per the department. There are basic five prime things that should be known about IRCTC auto upgradation scheme. Read on to the following to know more of the same. At the time of preparation of the chart, upgradation is automatically conducted by the PRS – Passenger Reservation System. There is absolutely no authority given to the ticket examiners to do such kind of upgrade for any passenger under this scheme. Under this scheme, only and only waitlisted passengers are been given confirmed seats. The vacant berths are transferred to the other existing counters in accord to the existing practice. It means, in case there is no waiting list available on the train, and then no upgradation will take place. In case, if a passenger gets upgraded to the higher class of travel and later he or she cancels the ticket, then in that situation the cancellation charge of the original class are going to be payable. The upgradation of the passengers could be done to only one level of class only such as from 3 AC to 2 AC, sleeper class to 3 AC, 2 AC to first 1 AC, and likewise. The original PNR will remain unchanged of all upgraded passengers and every information will be provided from the PRS in case an enquiry is been made with the original PNR. In one PNR – maximum six of all passengers could be upgraded at the same time. None of them will be upgraded, in case there is non-availability of appropriate berths for the upgradation.